As rains and consequent floods continued to batter Himachal Pradesh on September 24, Punjab was also put on red alert for floods. The state has received copious amounts of rainfall for the past three days. On September 24, Punjab received 12 times the rainfall it usually does at this time of the year, says the Indian Meteorological Department (IMD). Seven out of its 20 districts received more than 10 times the normal rainfall. Few districts like Muktsar and Faridkot received 100 times and 83 times more than normal rainfall, which is highly unusual in September. Kapurthala and Tarn Taran districts received the highest absolute rainfalls of 229.5 mm and 206 mm respectively. Though, on the morning of September 25, clouds cleared and the sun shone in some of the districts in Punjab, the state still remains highly vulnerable to flooding. Haryana has also received heavy rainfall in the past few days with the entire state getting nine times the normal rainfall. Both the agrarian states of Punjab and Haryana are looking at considerable crop loss due to heavy rainfall. There are reports of extensive damage of up to 20 per cent to the Kharif crop in Punjab, along with neighbouring Haryana. Rice and cotton crops, both at the stage of harvest, are the worst affected. Farmers are facing additional losses as they can’t find buyers for their already harvested but wet crops in the agricultural markets. Moreover, the floods in Himachal Pradesh are not going to abate anytime soon as most of the rivers and tributaries, especially the Beas, are still in furious spate. Water in the Pong dam has reached close to the danger mark and 49,000 cusecs of water was released from it on the afternoon of September 25. On September 24, the state received six times the normal rainfall while three districts of Chamba, Hamirpur and Kangra received more than 10 times the rainfall. According to the National Disaster Management Authority (NDMA), 43 people have died in rain-related incidents in the state while seven are missing. The floods have affected 226 villages in the state spanning six districts. The apple orchards in the state have been severely affected by the incessant rains. 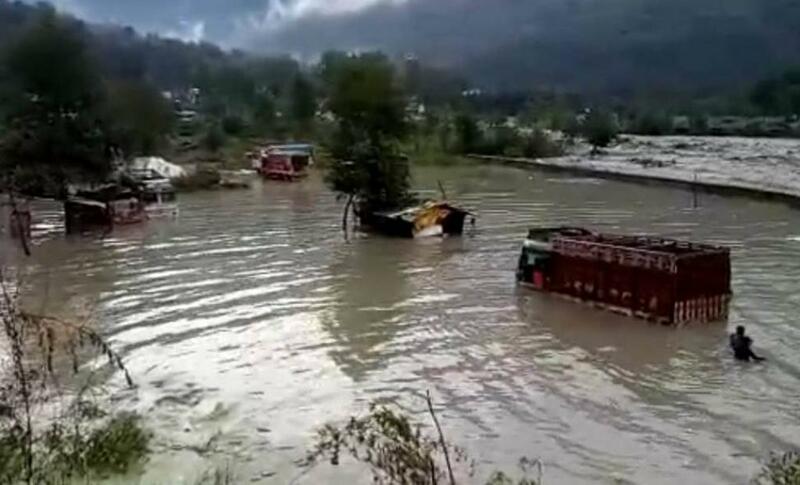 In Jammu and Kashmir too rains are wreaking havoc in districts like Anantnag, Kathua and Samba which received 17, 34 and 20 times the normal rainfall. Unusually heavy rainfall was also seen in Kargil and Ladakh where rainfall in excess by 79 and 70 times was recorded by the IMD on September 24.